The chemical elimination method generally applies an antistatic agent on the surface of the substrate to make the substrate conductive, forming a slightly conductive insulator. The application of chemical elimination is very limited in practice. For example, when chemical components are added to printing paper, it is likely to have an adverse effect on the quality of the paper, such as reducing paper strength, adhesion, tightness, tensile strength, etc. Therefore, chemical methods are not widely used. The physical elimination method is a method that eliminates the inherent characteristics of static electricity without changing the properties of the material, and makes the most frequently used method in the existing process. (1) "Earthing" elimination method, which makes the simplest method, use a metal conductor to eliminate the static electricity connected to the earth and make it equal to the earth potential, the charge leaks through the earth and does not leak, but this way for the insulator Almost no effect. The surface resistance of the printed material decreases with increasing relative humidity of the air. Therefore, by increasing the relative humidity of the air, the conductivity of the surface of the paper can be increased and the charge leakage can be accelerated. The suitable environmental conditions for the printing shop are: the temperature is about 20 degrees, and the ambient humidity of the charged body is increased to more than 70% as a measure of electrostatic safety. Inductive static eliminator stick: The induction electrostatic elimination brush, the principle is: When the tip of the electric appliance is close to the charged body, the electric charge whose polarity is opposite to the electrostatic polarity on the charged body can be induced at the tip and moves at the tip. This neutralizes static electricity. The use of this method is gradually decreasing. High-voltage discharge static eliminator: According to the structure is divided into electronic and high-voltage transformer type, according to the polarity of the discharge can be divided into unipolar and bipolar, unipolar static eliminator only has an effect on a charge, bipolar Can eliminate any kind of charge. In addition, in the printing process, static elimination brush and high-voltage discharge can be combined to eliminate static electricity. Jinan Drake Co., Ltd. launched the 969 power supply with DJ62 high-efficiency static eliminator, which has been widely used in the printing and packaging industry due to its good static elimination effect. In areas where there is a risk of explosion, an explosion-proof static eliminator must be selected according to the hazardous area class, medium class, and group when using high-voltage corona discharge and ion flow static eliminators. The length of the discharge electrode of the induction type and high voltage corona type static eliminator should be greater than 10-12 cm of the width of the electrified body. The form and number of the ion current static eliminator ion shower head should be set according to the possible installation distance and the width of the electrified body. The static eliminator should be selected based on the level of the electrostatic potential of my body, elimination requirements, operating characteristics, explosion hazard areas, media levels, and groups. The principle of installation location of static eliminator: easy to operate, eliminate the effect; follow the subsequent part of the solvent, avoid the metal background. Electrostatic safety measures must be applied to all process equipment and sites that have electrostatic hazards. In areas where explosive gasses may be present in the surrounding environment, ventilation measures must be intensified to keep the concentration below the explosive range. Preventing static insulators from causing damage to operators In case of electric shock, the static potential of the insulator should be controlled below 10 kV. In the event that the static electricity will cause secondary electric shock when the operator is shocking, in addition to the above, the corresponding measures shall be taken for the device or device. In areas with explosion and fire hazards, operators must wear anti-static shoes and anti-static overalls. The operating area shall be provided with conductive ground. The conductive ground-to-ground resistance shall be less than 10 ohms, and it shall always maintain its conductive performance. It is strictly forbidden for operators to enter the above-mentioned area except for clothes with synthetic fibers (except clothes that have been regularly treated with antistatic solution). It is forbidden to take off clothes in the above areas. In short, the printing industry workers must pay enough attention to the static electricity generated in the production process to ensure production safety. 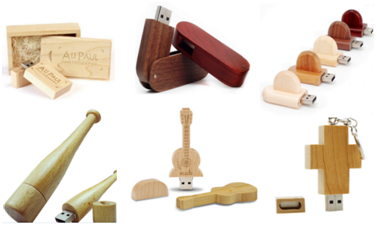 All of our wooden USB are easily use for work and gift. Q1: How about payment terms ? Q2 : Can I have my order with my logo? A: Yes,we can engrave your logo . Q3:Is it available to get samples before ordering?